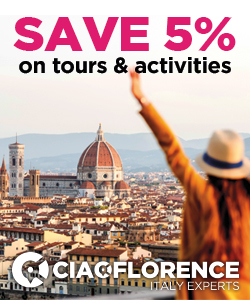 Florence is city of angels. They are everywhere in churches and art galleries, and there are so many of these heavenly messengers packed into the Uffizi, it’s a wonder the roof stays on. 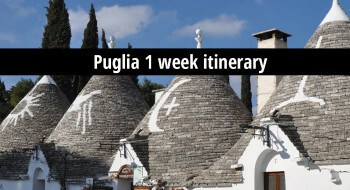 The collective noun for so many is a ‘host’ or ‘choir’, but it might just as well be an ‘Uffizi’. But amidst all those feathered wings, few people stop to consider that the mythical beings that wound up as cute putti started out rather as rather more sinister creatures. 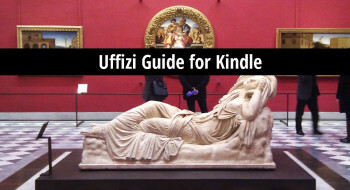 Around Florence, glimpses of these strange, Old Testament angels are to be found in the city’s Medieval art. 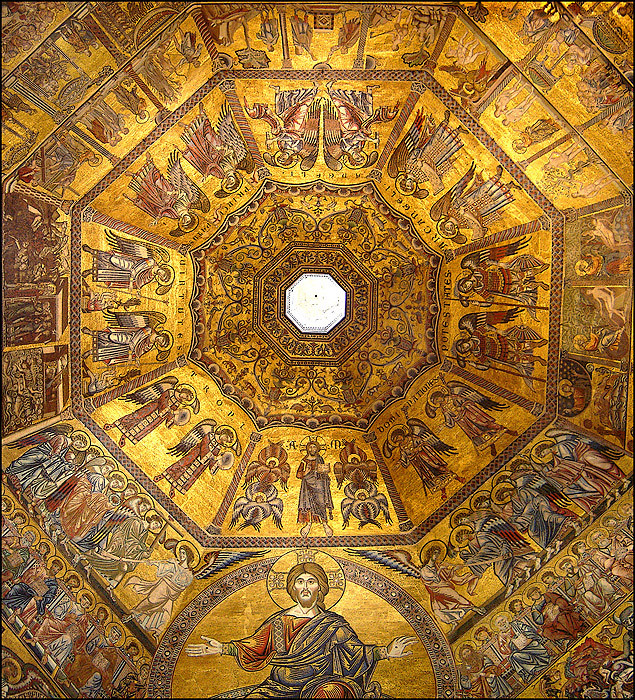 Some of the oldest angels in Florence are represented in a mosaic showing the hierarchy of angels inside the dome of the Baptistry of San Giovanni, executed between 1225 and circa 1310. 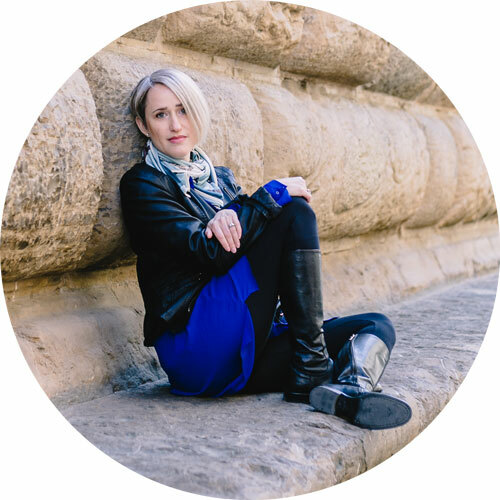 The Abrahamic faiths developed hierarchies of angels, and the Christian Angelic Hierarchy is divided into three spheres, each containing three types of angels. Of the most powerful sphere, two readily recognizable names are the Cherubim and Seraphim, but their descriptions from the Bible might surprise you. Above him were seraphs, each with six wings: With two wings they covered their faces, with two they covered their feet, and with two they were flying. And they were calling to one another: “Holy, holy, holy is the Lord Almighty; the whole earth is full of his glory.” At the sound of their voices the doorposts and thresholds shook and the temple was filled with smoke. High inside the dome of the Baptistry, around the lantern, is a depiction of the Christian Angelic Hierarchy, and in one panel Christ is shown flanked by two red Seraphim, complete with their six wings. Christ flanked by Seraphim and Cherubim. Variously attributed to Andrea Tafi and Apollonio, and Fra Jacopo. Photo: Sailko (CC-BY-SA 3.0). …they had the likeness of a man. Each one had four faces, and each one had four wings. Their legs were straight, and the soles of their feet were like the soles of calves’ feet. They sparkled like the colour of burnished bronze. The hands of a man were under their wings on their four sides; and each of the four had faces and wings. Their wings touched one another. The creatures did not turn when they went, but each one went straight forward. As for the likeness of their faces, each had the face of a man; each of the four had the face of a lion on the right side, each of the four had the face of an ox on the left side, and each of the four had the face of an eagle […] their appearance was like burning coals of fire […] and out of the fire went lightning. This startling description hardly aligns with the cute and friendly image of angels that we have now. This is because of their ancient origins. The book of Ezekiel describes visions the prophet experienced whilst in exile in Babylon in the 6th Century BCE, and his description of Cherubim originates from Babylonian and Assyrian mythical creatures that were part-human and part-animal: Lammasu, Shedu and Apkallu. What were the features of these ancient angels? Wings are a constant feature of these creatures, showing their divinity. In the Book of Revelation (4: 6-8) in the New Testament, the four Cherubim, or ‘living creatures’ before the throne of God are described as having only one face each, and those faces are the same four mentioned by Ezekiel, now divided amongst the Cherubim: that of a man, a lion, a bull and an eagle. They are now also described as being covered in eyes. One of their duties was to guard the way to the tree of life in the Garden of Eden, and it is a human-faced Cherubim that can be seen driving Adam and Eve from the Garden with a sword in the story of Genesis in the Baptistery. Left: Lammasu, from the throne room of King Sargon II, Khorsabad, c.721-705 BCE. Oriental Institute Museum, University of Chicago. Photo: Trjames (CC-BY-SA 3.0). Centre: Apkallu (a sage, or protective spirit) from the Temple of Niurta, Nimrud. c.865-860 BCE. British Museum. Photo: Jean-Pierre Dalbéra (CC-BY-SA 2.0). Right: variously attributed to Andrea Tafi and Apollonio, and Fra Jacopo. A Cherubim drives Adam and Eve from the Garden of Eden, Story of Genesis, Baptistry of San Giovanni. Photo: Sailko (CC-BY-SA 3.0). 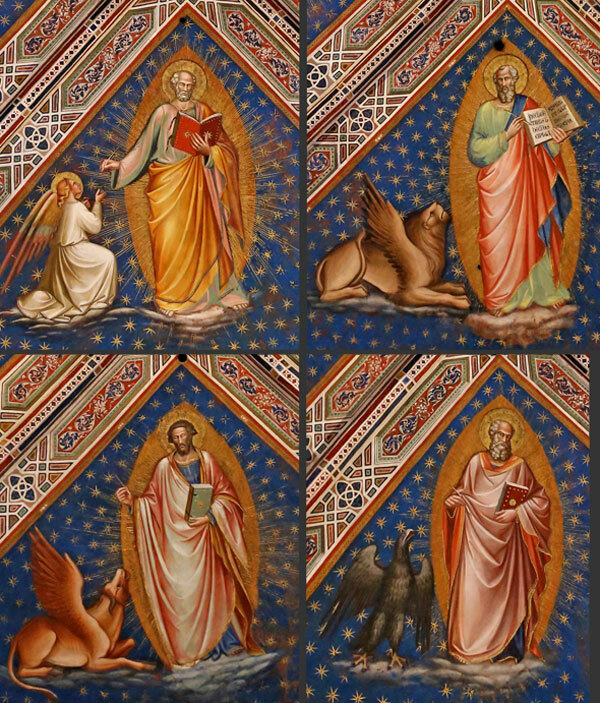 In time, the four different faces of these ‘living creatures’ became associated with the Four Evangelists, gradually being given deeper layers of meaning by later Christian theologians like Saint Jerome. Across the Arno, in the sacristy of San Miniato al Monte, the ceiling is decorated with frescoes by Spinello Aretino, showing each of the Evangelists with their symbols, all winged: Matthew is shown with a winged man, or angel, Mark with a winged lion, Luke with a winged bull, and John with an eagle. In art these symbols frequently stand in for the Evangelists themselves. Spinello Aretino, the Four Evangelists with their Symbols. Sacristy of San Miniato al Monte, 1387-88. Photo: Rufus46 (CC-BY-SA 3.0), details adapted by author. The Cherubim weren’t specifically identified as angels in the Old Testament, but in time they were fitted into the Christian Angelic Hierarchy, in the First Sphere along with the Seraphim and Ophanim (also called Thrones). In the Second Sphere were the Dominions, Virtues and Powers, and finally in the Third Sphere were the Principalities, Archangels and ‘ordinary’ angels. These other orders of angels are all shown in the ‘Angel Hierarchy mosaics’ in Florence’s Baptistry, but the Ophanim, here called Thrones (‘TRONI’), are once again not depicted as they are described by Ezekiel saw them: two fiery wheels, one within the other, and covered with eyes, and Ezekiel describes them as accompanying the Cherubim. They are called Thrones because the Throne of God moved upon these fiery wheels. The Virtues (here ‘VIRTUTES’) were thought to be conduits for signs and miracles in the world, and in the Baptistry they are shown casting out demons that have possessed two people. As angelic warriors, the Powers (‘POTESTATES’) are shown in armour, with shields and weapons, this equipment [the author’s area of specialty] actually is a key to a question of the attribution and dating of the mosaics. There wasn’t a strong tradition of working in mosaic in Florence, and whilst we know that the work was begun in 1225 by a Franciscan called Fra Jacopo, it is generally thought that the work was continued by Venetian craftsmen who were brought to the city to do the work (confirmed by a document of 1273), working to cartoons provided by Tuscan artists. 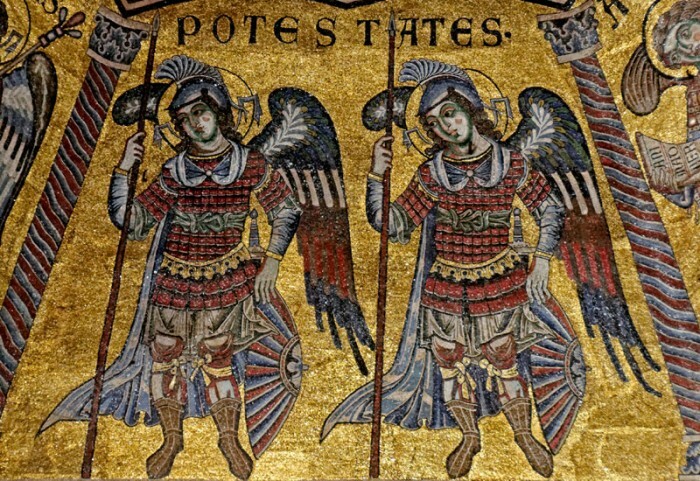 But these angels are wearing armour of purely Byzantine style, which was a type of Oriental lamellar armour not in common use in Tuscany at this date, as other depictions of warriors from this period confirm. Warriors in other sections of the mosaics similarly wear Byzantine equipment, and there is no doubt that the other angels in the Hierarchy are wearing very Byzantine clothing. Regardless of stylistic arguments, there is no clear reason why a Tuscan artist would dress his angels in what was effectively exotic foreign clothing. So I would suggest that the original designs that the craftsmen executed were drawn up by an unknown Venetian Master or Masters, in the Byzantine style. These are not Tuscan angels. Among the Archangels was another warrior angel, the Archangel Michael. In the Book of Revelation, Michael was the leader of the Heavenly Host, which defeated the army of rebel angels in the war in heaven. He is typically depicted in armour, so he is not shown in the Baptistry, because here the Archangels wear Byzantine robes. 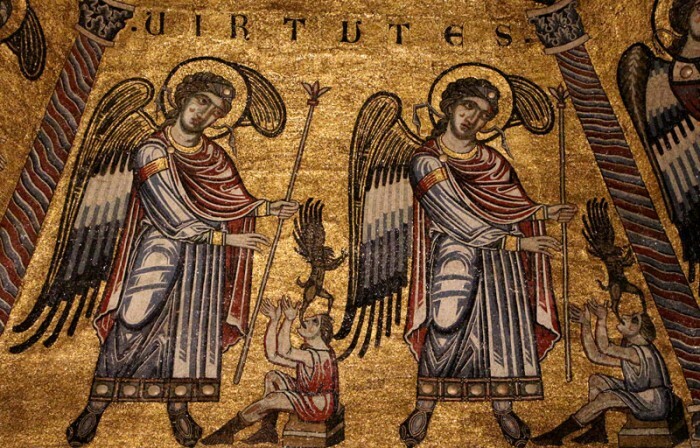 However, when the rebel angels were defeated, Michael cast down their leader, Satan, who Thomas Aquinas identified as another Seraph, and this angel, now hideously disfigured, is shown in the Universal Judgement of the Baptistry. well is it said that from him proceeds all grieving. when I saw three faces upon his head! sea-going sales I never saw so large. 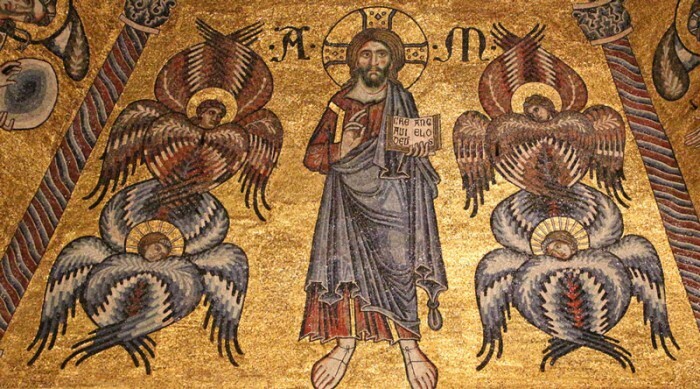 Here Satan has three pairs of wings, like the Seraphim (now like vast bats’ wings), he has multiple faces, like the Cherubim; and of course he is frequently described as having cloven hooves, and the Cherubim had hooves (‘calves’ feet’). 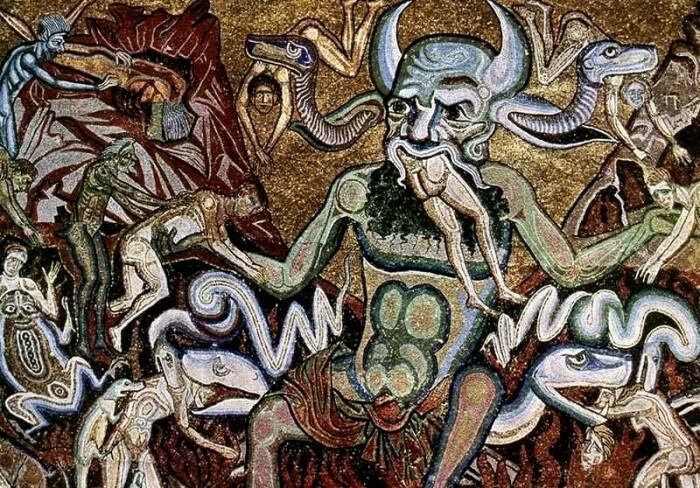 The Baptistry Satan has neither hooves nor wings, and he is not exactly as Dante described him, but issuing from his ears are two additional serpents’ heads, and all three mouths are busily grinding up sinners, just as in the Inferno. So it is with Dante and a fallen angel that I close this article, but if you are lucky enough to visit the Baptistry – and I do urge you to visit this beautiful building – then if you look up you will see that the angels are all there, both blessed and fallen, in glittering, beautiful mosaic. 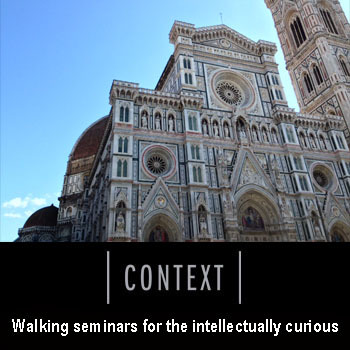 The Divine Comedy Illuminates Florence. Domenico di Michelino. Duomo, Florence, 1465. To the left of Dante an angel uses a sword to inscribe seven letter Ps on the brow of each sinner, to be erased as they progress through the levels of Purgatory. To his right is the angel weather vane on the spire of the Badia Fiorentina. Photo: Heroldius (CC-BY-SA 3.0). 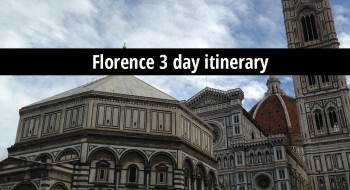 You can read more about the Baptistry of San Giovanni and the Florence that Dante knew in his book: A Blood-Stained Lily, Discovering Dante’s Florence. Independent writer and art historian Chris Dobson - formerly Master Armourer to the Royal Armouries – has worked for, in and around museums in the field of applied arts for nearly 30 years. 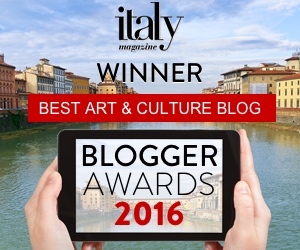 He now specialises in the art and history of Florence, his adopted city.